← BEACON Researchers at Work: The Evolution of Cooperation by the Hankshaw Effect: A Big Thumbs Up for Cooperation! 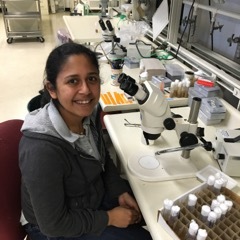 This week’s BEACON Researchers at Work blog post is by MSU graduate student Rewatee Gokhale. 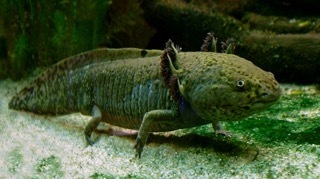 Axolotl, also known as Mexican Salamander. Meet Sal* the Salamander. Sal, like all of his kind, has a unique gift. He can regenerate his limbs, if you cut one off! This unique ability of salamanders has fascinated generations of scientists from Aristotle to Charles Darwin. And yet, there are many, many questions about this process of regeneration that we still do not understand. Primarily, how does the regenerating limb know what size it has to grow to? How is the correct final organ size achieved in the face of developmental growth perturbations and changes in environmental conditions? These questions form the basis of my research here at Michigan State University. I study developmental growth regulation in the common fruitfly, Drosophila melanogaster, an organism that may seem far removed from salamanders, humans and other large animals that we are more familiar with. However, the signaling pathways regulating growth are conserved all the way up from fruitflies to higher animals—in fact, most of these signaling pathways were first discovered in Drosophila. Consequently, any discovery of novel developmental mechanisms in Drosophila is of interest not just to fly biologists, but to the broader scientific community of developmental biologists. Moreover, the wealth of genetic tools available to manipulate growth and development in Drosophila is unparalleled, making it an excellent model system to answer challenging questions of developmental growth control. Drosophila is a holometabolous insect, meaning it undergoes complete metamorphosis during its life cycle—passing through 4 different life stages: embryo, larva, pupa and adult. 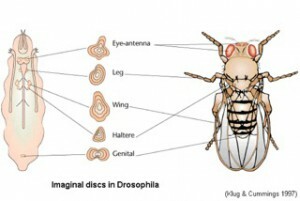 Unlike other animals, the adult does not grow in size, and therefore, the final body and organ size depends on growth of organ precursors (called imaginal discs in Drosophila) during the larval period. To put it simply, the larval phase of growth can be likened to growth and development through childhood and adolescence before entering adulthood. Two important factors regulate the final organ size achieved at the end of development: the duration of growth and the growth rate. Naively, one would expect that longer the developmental time, the greater the final size. In the context of larval development, perturbing the growth of one of the imaginal discs actually results in an increase in the total developmental time—presumably to allow the growth perturbed organs to “catch up” (Parker and Shingleton, 2011; Stieper et al., 2008). However, despite this increase in developmental time, the other unperturbed imaginal discs do not overgrow—in fact they reduce their growth rate to match that of the growth rate of the perturbed imaginal disc. Thus, growth rates appear to be coordinated among different organs so that, at metamorphosis, the final organ size is correctly proportioned in relation to the body and the rest of the organs. 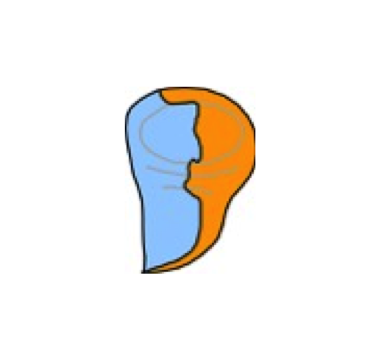 Diagrammatic representation of the wing imaginal disc with the shaded areas showing the two compartments of the disc. But what about growth coordination within an organ? If you could perturb the growth of one part of an organ, would the growth rate of the other unperturbed part also be reduced? This was the question that I was interested in answering when I started my PhD. In order to answer this question, we focused our attention on the wing imaginal disc, which ultimately forms the wing and most of the thorax of the adult fly. I generated larvae in which the two halves of the wing disc (called compartments) seemingly had different rates of growth; one compartment that grew slowly due to a defect in the protein production machinery, and another compartment which grew at normal or near-normal rates. We then looked at their relative rates of growth throughout development by measuring the sizes of each compartment in larvae sampled at various points in larval development. We found that similar to coordination between organs, the unperturbed compartment reduces its growth rate to match that of the growth perturbed compartment. What’s most exciting however, is that both intra- and inter-organ growth coordination during development seem to be regulated not by organ-specific mechanisms but by a common systemic mechanism, involving the hormone ecdysone. Ecdysone is an insect hormone that regulates metamorphosis through different stages of the insect life cycle. Research from our lab suggests that ecdysone functions not just as a molting hormone, but also functions as a regulator of imaginal disc growth rates during development. This suggests that in Drosophila, developing organs rely not just on organ-specific mechanisms to ‘perceive’ and reach their final size, but in fact respond to systemic cues as well. While most of the research that I have described here is focused on Drosophila, I would like to emphasize, that the basic developmental mechanisms discovered in this model organism are by no means unique to it. In fact, there is considerable evidence to suggest that localized growth defects also cause growth retardation and developmental delays in humans. For example, in children suffering from chronic inflammatory diseases such as Crohn’s disease there is a systemic growth hormone insensitivity. Consequently, these children also suffer from stunted growth and severe growth retardation (Sanderson 2014). Therefore, the utilization of systemic signaling mechanisms in the maintenance of “correct” organ size appears to be an evolutionary conserved mechanism present not just in your common -run-of-the-mill fruitfly but in all animals. Parker, N. F. and A. W. Shingleton (2011). “The coordination of growth among Drosophila organs in response to localized growth-perturbation.” Dev Biol 357(2): 318-325.
ton (2008). “Imaginal discs regulate developmental timing in Drosophila melanogaster.” Dev Biol 321(1): 18-26. Sanderson, I. R. (2014). “Growth problems in children with IBD.” Nat Rev Gastroenterol Hepatol 11(10): 601-610. For more information about Rewatee’s work, you can contact her at gokhaler at msu dot edu. This entry was posted in BEACON Researchers at Work and tagged BEACON Researchers at Work, development, developmental biology, Drosophila, growth. Bookmark the permalink.